Perhaps because of his Cape Cod League exploits, Jacoby was on Boston ’s radar during his junior season at Oregon State. When the team sent a scout to watch the Beavers play San Diego State, the game was rained out. Coach Casey dragged the guy into the gym, handed Jacoby a basketball and told him to dunk. He did two-handed jams and 360s for the stunned baseball man. Later, Boston GM Theo Epstein himself traveled to Washington State to watch the Beavers play. Jacoby had a rare hitless day, but he did score from first base on a single. Epstein and the Red Sox loved him; the question was, would he still be on the board when Boston picked at 23? Jacoby had clearly matured as a hitter by this point. He worked counts, waited for pitches he could drive, and was comfortable hitting with two strikes. As junior, he batted .415 with six homers, 42 RBIs and a school-record 86 hits in 50 games. Jacoby was perfect in the field, handling 117 chances with no errors. He also stole 21 bases to give him a total of 56 for his three college seasons. Jacoby was named PAC- 10 Co-Player of the Year along with Trevor Crowe of Arizona. The Beavers, meanwhile, set a record for victories and advanced to the College World Series for the first time since 1952. In the draft, Jacoby figured to move up the depth charts of most teams. But as luck would have it—especially for the Red Sox—he lasted until Boston’s spot came around. Jacoby signed for a $1.4 million bonus with the Bosox and began his pro career in July with Lowell of the Class-A New York–Penn League. He gave the Spinners a preview of things to come in his first at-bat, when he worked out a walk, stole second, went to third on an errant throw and came trotting home on a wild pitch. He would swipe nine bags in nine attempts in his first two weeks and finish the short-season schedule with 23 steals. Jacoby batted .317 for manager Luis Alicea and flashed occasional pop. Among Jacoby’s teammates that season were pitcher Clay Buchholz and longtime buddy Lowrie. Jacoby leapfrogged the standard Low-A stop on the organizational ladder in 2006, beginning the year with the Wilmington Blue Rocks of the Carolina League. He played 61 games with the team, batting .299 with 25 steals and earning a spot on the circuit's All-Star team. He was promoted to Class-AA Portland in mid July. Jacoby boosted his average over .300 and swiped 16 more bags. That showing convinced the Red Sox that Jacoby might be major-league ready in 2007, which in turn earned him a spot in the Arizona Fall League with the Peoria Javelinas. He hit a respectable .276 against first-rate competition with a team-high seven stolen bases. After a couple of months off, Jacoby reported to the big club’s spring training camp in Fort Myers. He enjoyed rubbing elbows with the likes of David Ortiz and Manny Ramirez, and then was reassigned to the minor-league camp with the promise that another solid performance would result in a call-up when the club needed a center fielder. The second part of that scenario was likely; since the departure of Johnny Damon, the team had been hurting at the position. Coco Crisp was an adequate player, but he was hardly the table-setter the Red Sox needed at the top of the lineup. Jacoby returned to Portland for a month and hit .452 before being promoted to Class-AAA Pawtucket. He played flawlessly in the outfield, was a demon on the basepaths and kept his average around .300 against his new level of competition. As July approached, Jacoby was pleased to learn that he had been selected to play in the Futures Game. He was even happier to hear later that he wouldn’t be playing in the event. The Red Sox called him up on June 30the when Crisp was injured. Jacoby singled off Robinson Tejada of the Texas Rangers in his first at-bat. A few days later, he stole his first base. In the same game, he hustled all the way home from second base on a wild pitch. Johnny Pesky couldn’t stop raving about the rookie, calling his scamper the greatest play he’d ever seen. Even with Pesky’s endorsement, Jacoby was returned to Pawtucket three days later when Crisp was ready to re-enter the lineup. Jacoby picked up right where he left off. He finished the season with Pawtucket batting .298 with 33 stolen bases. He also put together a 25-game hitting streak in August. In the middle of that streak. Jacoby logged one more game in the majors. He was called up to start the second half of a double header, and then immediately shipped back. Jacoby’s third and final trip to the big leagues came on September 1st. He joined the team for a series against the Baltimore Orioles and hit his first home run the next night against hard-throwing Daniel Cabrera. The ball landed in the Boston bullpen, so he got to keep it as a souvenir. Jacoby played in 26 games for the Red Sox and was a revelation. All told, he batted .353—torching righties and lefties equally. He slugged over .500, with 11 of his 40 hits going for extra bases. 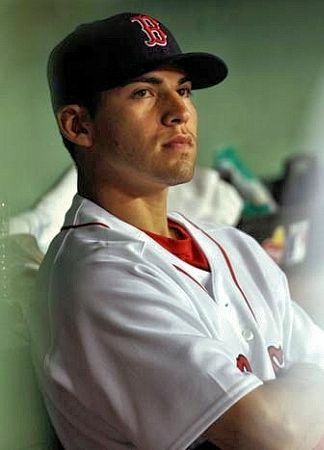 Jacoby was one of three impact rookies for the Red Sox in 2007. Dustin Pedroia batted .317, and Buchholz emerged from the minors and twirled a no-hitter in only his second major-league start. Boston held off a charge by the Yankees to capture the AL East and swept the Los Angeles Angels of Anaheim in the Division Series. Red Sox manager Terry Francona went with experience over the hot hand, starting Crisp all three games against the Angels. 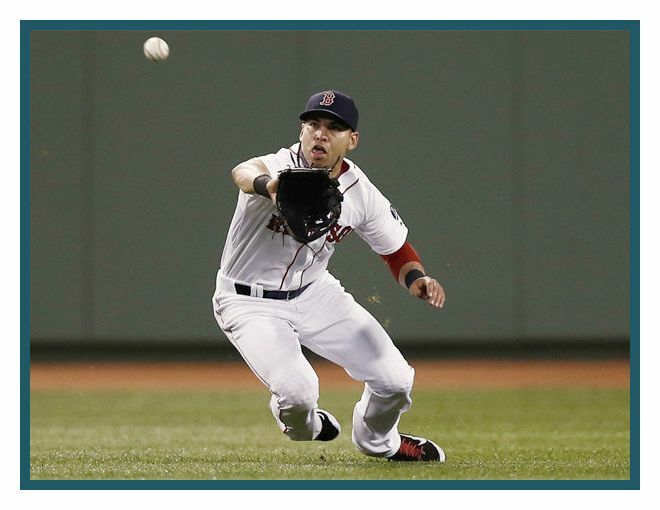 Jacoby saw limited action as a defensive replacement for Ramirez. Crisp was still the man when Boston met the Cleveland Indians in the ALCS. The Red Sox won the opening game but lost the next three. Part of the problem was Crisp, who couldn’t buy a hit. Boston crept back into the series with a 7–1 thrashing of the Tribe in Game 5. Francona then decided to insert Jacoby in the lineup. In Game 5, a first-inning grand slam by J.D. Drew gave Boston a 4–0 lead, and the Red Sox piled it on after that, knotting the series with a 12–2 victory. Jacoby contributed a hit, a run and an RBI and earned a Game 7 start. Jacoby rewarded Francona’s confidence with a second-inning single. The Red Sox led 3–2 in the bottom of the seventh when Jacoby’s speed helped create a miscue by third baseman Casey Blake. Pedroia followed with a homer over the Green Monster for a 5–2 lead. One inning later, Jacoby was walked intentionally and scored on a Pedroia double. The Red Sox cruised to an 11–2 win and their second AL pennant in four seasons. Boston was a different team with Jacoby in the lineup. For the World Series showdown with the white-hot Colorado Rockies, Francona decided to stick with his rookie outfielder. Jacoby batted at the bottom of the order, where he was essentially a second leadoff hitter. He was quiet at the plate in the first two games, a 13–1 blowout and a 2–1 nail biter—both Red Sox wins. For Game 3, Jacoby found himself batting leadoff. He responded with four hits—including three doubles. In game 4, he collected two more hits, including another. Boston won twice to complete its World Series sweep. Mike Lowell was named the series MVP, but the honor could just as well have gone to Jacoby, who sparked the team with his defense, baserunning and hitting. In 11 postseason games, he batted .360 with nine hits and a couple of stolen bases. Jacoby was technically still a rookie in 2008, and there was great hope in Boston that he would win Rookie of the Year—especially after he bulked up by 15 pounds over the winter. He started well, enjoying his first multi-homer game against the Angels in April. Jacoby continued his great play, running his streak to 25 steals from the beginning of his career before he was finally thrown out in a May game against the Milwaukee Brewers. He was just two short of the record set Tim Raines. In June, he had back-to-back three-steal games. The last Boston player to pull a trifecta was Jerry Remy in 1980. It was still June when Jacoby swiped his 32nd base. Jacoby slowed down as the season wore on, partly because he missed 17 games to a collection of bumps and bruises. He did finish as the league leader with 50 steals, but came up four short of the team record, established by Tommy Harper in 1973. His other numbers were excellent, including a .280 batting average and 98 runs. He finished third in the Rookie of the Year voting behind Evan Longoria and Alexei Ramirez. The Red Sox faced the Angels again in the Division Series, and Jacoby provided the spark in the four-game victory. He batted .333 average and three stolen bases. In Game 3, he hit a bloop single with the bases loaded and two outs. With the runners in motion, all three scored. It was the first three-run single in postseason history! The Red Sox faced the surprising Rays in the ALCS, and the magic suddenly disappeared from Jacoby’s bat. He went hitless in the first three games and was benched in favor of Crisp. He watched from the bench as his teammates made an amazing comeback to even the series, but Boston eventually lost in seven games. Jacoby began 2009 like a man on a mission. The mission was to get the Red Sox back to the World Series, and obliterate the team stolen base mark in the process. One of his steals came against the Yankees in April when he swiped home off Andy Pettite with the bases loaded. It was the first pure steal of home for a Red Sox player since 1994. Jacoby stole his 55th base on August 25th to eclipse Harper’s team record, and finished the year with 70 to lead the AL for the second year in a row. He also led the league with 10 triples and batted .301. Despite Jacoby’s fine performance—and the late-season acquisition of Victor Martinez—Boston could not catch the Yankees in the AL East. Nine losses to New York in the second half sealed the team’s fate, but the Sox still finished with 95 wins, which was good enough for a Wild Card slot. Facing the Angels in the Division Series, the Boston bats went silent. They scored once in the first two games, and then lost Game 3 by a score of 7–6 when the bullpen allowed five runs in the final two innings. The 2010 season found Jacoby playing in front of the Green Monster. Boston signed Mike Cameron over the winter and installed him in centerfield. Cameron had no experience in left, and Terry Francona was hoping that Jacoby’s aggressive defense would pay dividends in Fenway’s tricky left field. Unfortunately, playing so close to the infield resulted in a collision with third baseman Adrian Beltre, resulting in broken ribs and an on-and-off recovery that cost him almost the entire season. Jacoby finished the year batting a meager .192 in 18 games. Boston fans kept their fingers crossed for a bounce-back season from Jacoby in 2011. What they got exceeded even their wildest expectations. He played the entire year, leading the league with 732 plate appearances and 364 total bases, winning his first Gold Glove and finishing second in the MVP voting by just 38 points to pitcher Justin Verlander. Prior to the campaign, the Red Sox were one of the only teams without a member of 30–30 club. Jacoby changed that with 32 homers and 39 stolen bases. He also notched career highs with 212 hits, 119 runs, 105 RBIs and a .321 average. Jacoby would likely have won the MVP were it not for a historic September collapse in Boston, during which the team lost 18 of 24 games and went from World Series favorites to missing the playoffs altogether. Things went from bad to worse in 2012, when Jacoby injured his shoulder breaking up a double play. He missed more than half the season and batted just .271 with four home runs. The Red sox won just 69 games and finished in the AL East basement. The Red Sox reloaded for 2013 against a division that looked tougher than ever. Despite no real career years by any of the pitchers and hitters, Boston found a way to get the job done week after week, and slowly built an insurmountable lead in the division. The Red Sox finished 5 ½ games up on the Rays and had the second best record in the AL at 97–65. Despite missing a month with a broken foot, Jacoby had a solid season, batting .298 and leading the club with 92 runs. His power was way down, with just nine home runs, but he led the AL in steals for the third time with 52. Led by Jacoby’s lusty hitting, the Red Sox disposed of Tampa in four games during the ALDS, and then defeated the Tigers in six to win the pennant. He went 16-for-40 in the two postseason series. The key to the ALCS was taking two of three one-run games in Detroit. In Boston’s 4–3 victory in Game 5, Jacoby got a clutch hit off Anibal Sanchez to drive home the final run in the team’s 3-run second inning. The Red Sox faced St. Louis in the World Series. The Cards took two of the first three games, but Boston rebounded to take the final three, winning it all in front of the Fenway fans for the first time since 1918. Jacoby batted .250 with an RBI and four runs scored. He ignited the winning rally in Game 6. After the season, Jacoby decided to test the free agent waters. The Red Sox, with Jackie Bradley Jr. in the wings, had decided not to get into a bidding war. In turn, Jacoby signed a seven-year contract with the Yankees worth more than $150 million.